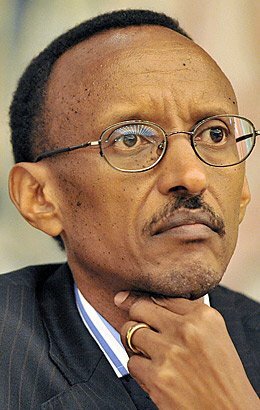 RWANDA: AFTER PAUL KAGAME’S LIES, WHAT IS NEXT? PRELUDE. « The last official government census of 1991 (to which no oppostion party nor the RPF objected at the time) had approximately 595,000 Tutsis in Rwanda with about 40,000 in Kigali. Most of the dead on display at Gisozi are Hutus not Tutsis. General Dallaire made a report on April 15th 1994 that on April 14th the RPF pullled 14,000 Tutsi over to their lines. Bernard Kouchner put out a letter on May 22 after his visit to Kigali stating that 22,000 Tutsis were alive and protected in Kigali. So of 40,000 listed in the census, 6,000 are unaccounted for. The Tutsi intellectual Antoine Nyetara who was in Kigali throughout the events of April through July testified in our trial that the FAR did not kill Tutsis and that the killings began after the RPF took the city and ordered all the people to gather in the various stadiums. Once there he said they began selecting Hutus who were businessmen, educated, teachers, doctors, students and executing them on the spot. He stated that if any Tutsi tried to protest then they were shot as well. He added that he was surprised to see that when the RPF forces entered the city they were not mainly Tutis but were composed of many Eritrean, Somali, Sudanese mercenaries as well as Tanzanians. There was no genocide in the legal sense of a plan by the government or army to kill civilians of an ethnic group-that is not what happened. There is evidence of plans by the RPF to exterminate Hutus (viz the Gersony Report etc…).We should stop using the word « genocide » to describe events in Rwanda. It was a four year war-and in the 1994 events from April through July, a war by the RPF against the government in which many innocent civilians on both sides were killed-that is not genocide-that is war-and those responsible for it are in the RPF and the Western governments and the UN that helped them. »-Christopher C. Black. Dwight D defines ‘Leadership’ as the art of getting someone else to do something you want done because he wants to do it. The idea of leadership in Rwanda has been highly overstated over the years.Ordinary Rwandans have fallen prey to a clique of Politicians whose interests have always been to enrich themselves and their minions. If you ask any third party who understands Rwanda from ‘Hotel Rwanda’ movie perspective, they will tell you that the leadership of Paul Kagame put an end to a gruesome genocide against the ‘Tutsi’. But was that the case? The RPF has spent two decades playing the ‘victim’ by using our poor ‘Tutsi’ brothers are a front to enable their political guile to gain momentum. Generally,’Tutsi’ are hypocritical and liars like some people say but I for one think that they understand politics better.You know the ‘inferiority-complex’ mentality? It is only normal for the minority to be insecure where power is concerned and try to influence politics to safeguard their interests against majority politics. Anyway, that could be just a biased observation by my people. The problem with the Tutsi in power is that they do not care about their fellow Hutu and so long as they are eating well, Kagame can exterminate the whole Hutu race whilst they are watching but will do nothing to criticise the thin tall man’s modus operandi. As they say, war is just politics by other means and politics is just money. Hence, the continuous propaganda used by the RPF utilising Rwandans as a catalyst to effect his selfish desires. Opposition can be defined as resistance or dissent, expressed in action or argument or a contrast or antithesis. « When Paul Rusesabagina announced the formation of his party surrounded by an entourage of what looked like American political advisers, he invited Colonel Luc Marchal -the same Luc Marchal who led the Belgian contingent as part of UNAMIR in Kigali before the country descended into chaos -to speak at the event. The Colonel spoke in details about how General DeGaulles had to assemble all of the French resistance movements under one command structure for the French resistance to be successful against the Nazis; and recommended that all of the opposition groups to Kagame’s regime do the same. He stressed that unless they do that the international community will never take them seriously. I wonder if our politicians in attendance understood what this speech was about!! »-Darius Murinzi. Some American friend once paused this question to me-so, what you Rwandans in the diaspora have in common is the hate against Paul Kagame? He was of the view that what led Rwandans to flee from Rwanda is far from ideological. It is common knowledge that the Rwandan opposition has not agreed on a common front. However, that is the thing of the past. Over the past years, there has been tremendous changes where reconciliation is concerned. Rwandans in the diaspora are learning to work together slowly but surely whether they share the same principles or not. The arrest of Emmanuel Karenzi Karake showed how far collective effort amongst our people can change Rwanda for the better. Special thank you to David Himbara once again. We might not as united as the RPF would want but we are willing to work towards that. I was groomed to think that the Democratic Forces for the Liberation of Rwanda(FDLR) was a hostile rebel group composed of former ‘Genocidaires’. This was due to the RPF propaganda that led to the UN declaring the FDLR a ‘hostile’ force. Nevertheless, without the FDLR innocent Hutu women and children in the jungles of DR Congo would have come to a planned extinction. After all, Paul Kagame almost materialised his vindictive plans during The First Congo War (1996–1997). By now, it is factual that the FDLR is a peaceful organisation whose main mandate is to pretect Rwandan refugees against the RPF’s attacks. Whether they use force or not is irrelevant so long as they protect lives of civilians. The FDLR has survived for over 21 years in the face of a gullible international community and are known to be the only serious threat to the Kigali regime.It would therefore be prudent for the Rwandans in the diaspora to rally behind the FDLR and support their political cause. If history is anything to learn from, the war against Paul Kagame needs all Rwandans to put their differences aside and capitalise on eachother’s strengths. If politics is like a hula hoop, any changes are a working progress. The French say; « On n’apprend pas aux vieux singes à faire des grimaces. » Paul Kagame is one stubborn fellow who is only waiting for death to put an end to his rule. Before this happens, it is important that we be ready to take over a broken people. Only a sober approach will be able to find a durable solution to our people’s problems.